Garnet rose cut gemstones set onto sterling silver teardrop shaped dangle earrings. 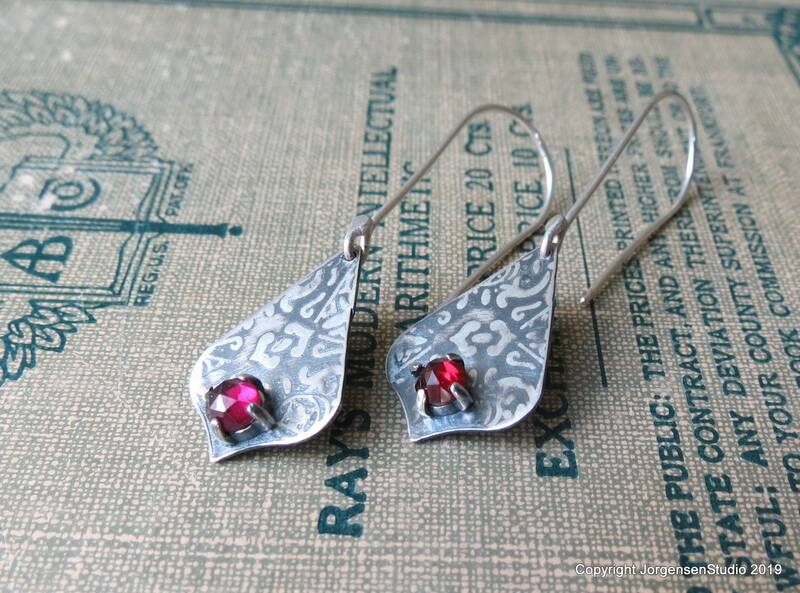 These boho earrings have a old world pattern that has been patinated to show off the detail. They have an slightly medieval style about them. * teardrop measures 3/4 inch long, just over 1/2 inch wide. 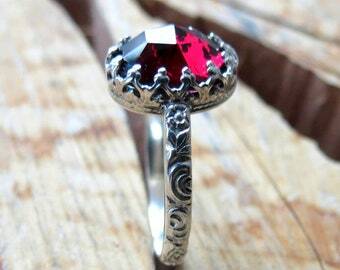 The garnet gemstones are a rose cut cabochon cut that measures about 4mm round. * Last picture shows same size earrings in ear for scale. 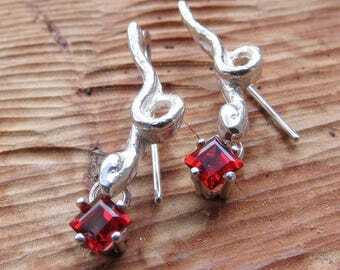 This listing is for the garnet earrings. 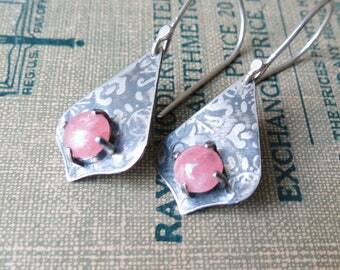 These can be ordered custom made with other gemstones - contact me to discuss designing your perfect earrings. These are ready to ship as shown. Please see my policies and shipping pages for additional important information. Items will be wrapped in modern paper and ribbon with bow. 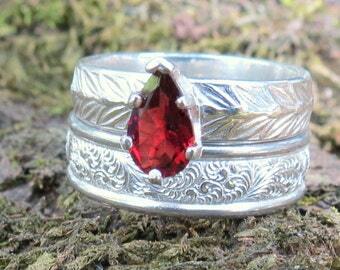 Really beautiful, great quality rings. Would order again.....and might! Thanks! Thank you so much!!! 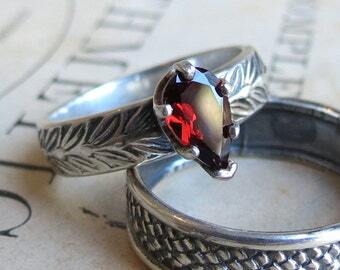 The stone is gorgeous, it looks just like my old one. Outstanding customer service, she was able to remake a ring I bought from her and lost a while back, and I'm so happy. She was very sweet and all of her jewelry is very well priced. Highly highly reccomend. Thank you so much!!!! If you have a question on the time frame for your made to order item please contact me. Your approximate ship date can be found on the upper right side of your receipt page. If you are having difficulties please contact me so I can assist you from my end. If you are not happy with your purchase for any reason please let me know so I may fix the problem. I am more than happy to make size adjustments when I can, or make alterations when necessary. If you would like to return the item, it must be sent back to me (mailed) insured within 7 days of receipt in the unworn and new condition it was sent to you in (and in the same jewelry box shipped in to protect it from damage). Your refund will exclude shipping costs and a small restocking fee of 5% to cover non refundable fees incurred on the transaction. 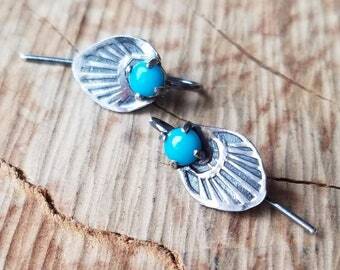 ***** Worn earrings cannot be returned for hygienic reasons. 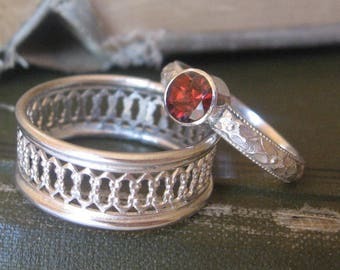 **** Custom sizes (rings made to order in your size) and Custom work (items different from what is listed in my shop) cannot be returned unless there is found to be a flaw in the workmanship. Rings made to order to size cannot be returned. Please understand that special ordered gemstones are not returnable. If you are not sure of your ring size, please contact me for a free emailed ringsizer before purchase. I can in most cases resize up a half to full size for free, but beyond that I can fully resize a made to order item for a 20.00 fee which covers my labor and supplies. If you need help with sizing I would be happy to email you a ring sizing gauge. I take every precaution to insure your order arrives quickly and safely to you. All items are shipped with insurance. All items to an Apt. or over 95.00 will be shipped with signature required. I use Etsy labels for shipping, please take a minute and make sure your "ship to" address is correct. if you used the Etsy direct checkout the Etsy address provided will automatically be the ship to address. I normally ship USPS first class for both domestic & international. Please be aware there was a large international increase from the USPS in January. It is my policy that all orders to an apt. address will be shipped with signature required. Domestic priority mail (2-3 days) and Domestic Priority Express is available from the drop down menu on the checkout page for additional postage. International priority & express is available to some countries please check the drop down menu on the checkout page. If you have any questions about the arrival time of your pieces please feel free to contact me. I would be happy to help make sure your package arrives in time for your special day. Please contact me for a quote before purchasing if you need your international order sent priority mail or express mail. The times listed for delivery pertain to the mail service & there may still be some time needed to fabricate your piece. Please contact me if you have any questions about the arrival of your order. The customs and tariff fees for international shipping are the responsibility of the buyer. I do my best to make sure things reach you safely and quickly but I have no control over customs or foreign postal services. Please note that some countries have different rules as to what can and cannot be imported, please be aware of your country's rules before purchase. I cannot at this time ship to Italy or Mexico. Please be aware of your own countries import and customs fees. I cannot see them from the US when I ship your item out. Some countries charge a customs handling fee in addition to the customs fee %. They are a tax your country levies on you for importing goods. It seems that the UK has changed their policy about incoming international packages and has started to impose a handling fee as well as a customs fee %. The handling fee seems to be somewhere around 8 pounds or 11 US dollars. The tariff varies according to the value of the item. Please be aware of these fees charged by your government if you are in the UK. I cannot mark the item gift on the customs form as it is illegal for me to do so. Austria also has a handling fee of about 10 euros added to the additional customs fee %. The lead times for your items to be made to order are business days, Monday through Friday. I try my best to take weekends off from the studio & spend time with my family. I usually am available to answer any questions you may have at night or during the weekend also, but please allow a bit more time to respond. Thank you! I do not send spam and I promise to keep the notices to sale notices and useful information. I will never sell or give your information to any other vendor or company. Wholesale: I do wholesale & love my wholesale customers. Please contact me for more information on availability & terms.